Muhammad's uncle, Hamza ibn Abdul Muttalib was a warrior and a hunter and was little interested in the day-to-day affairs of the city. Hamza, a man of his own age, was reputed to be the strongest and most active of the Quraysh, their champion in war and hunting. He spent most of his time hunting in the hills. Muhammad, the Apostle of Allah, though safe under the protection of his uncle, Abu Talib, was not immune from harassment by the polytheists. Whenever they found an opportunity to hurt and humiliate him, they didn't miss it. On one such occasion Abu Jahl found Muhammad alone, and used much vulgar and abusive language toward him. The same evening when his uncle, Hamza came home from a hunting expedition, with his bow swinging from his shoulder, his slave-girl recounted to him the tale of Abu Jahl's misconduct toward Muhammad and the latter's forbearance, of which she had been an eye-witness. Hamza found himself at the end of all patience. Abu Jahl's conduct towards Muhammad so roused his anger that he seized his bow, and went into the assembly of the Quraysh where he saw Abu Jahl sitting among his friends. Hamza lifted his heavy bow and gave a great bang on Abu Jahl's head with it. ‘Will you insult him when I join his religion?' he shouted, flexing his great muscles under the noses of the Quraysh. Hamza declared, "I too have become a Muslim." This was a challenge to Abu Jahl and inspite of all his power and the support he enjoyed among Meccans, Abu Jahl figured that silence was the better part of valour, and did not stand up to Hamza's challenge, even restraining his friends who wished to rise in his defense. Hamza accepted Islam in the fifth year of the Proclamation. Hamza became a Muslim, and this put teeth into the faith. The Quraish now began to be more careful with Muhammad and his men. The fear of Hamza in the hearts of Meccans was such that they avoided directly conflict with Muhammad. Hamza became a devout Muslim and a champion of Islam. He was the comrade-in-arms of his other nephew, Ali ibn Abi Talib, and it were both of them who killed most of the leaders of the Quraysh in the battle of Badr, to be fought a few years later. In the battle of Ohad, Hamza killed the second standard-bearer of the pagans, and when they charged the Muslim line, he plunged into their midst. He was hacking his way through their ranks when he was struck by a javelin hurled by Wahshi, an Abyssinian slave. Wahshi was engaged for this very purpose, by Hinda, the wife of Abu Sufyan and the mother of Muawiya, and by another idolater of Mecca. Hamza fell on the ground and died immediately. After the rout of the Muslims that day, Hinda and the other infidels from Mecca, mutilated the bodies of the Muslims martyrs. She cut open Hamza's abdomen, plucked out his liver, and chewed it up. She also cut his nose, ears, hands and feet, strung them into a "necklace," and entered Mecca wearing it as a trophy of war. Muhammad was deeply hurt and aggrieved at the death and at the mutilation of the body of such a towering personality of Islam as Hamza. 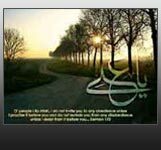 He bestowed upon Hamza ibn Abdul Muttalib the titles of the "Lion of God," and the "Chief of the Martyrs".